As the concepts of the proposed new life-science of “Atomic Biology” are formulated, it is necessary to provide updated definitions to assist in understanding the proposal. Below is a glossary of definitions as shown in this latest book, “Darwin’s Replacement.” It has just been released and can be found on Kindle and Amazon or by directly Contacting us. 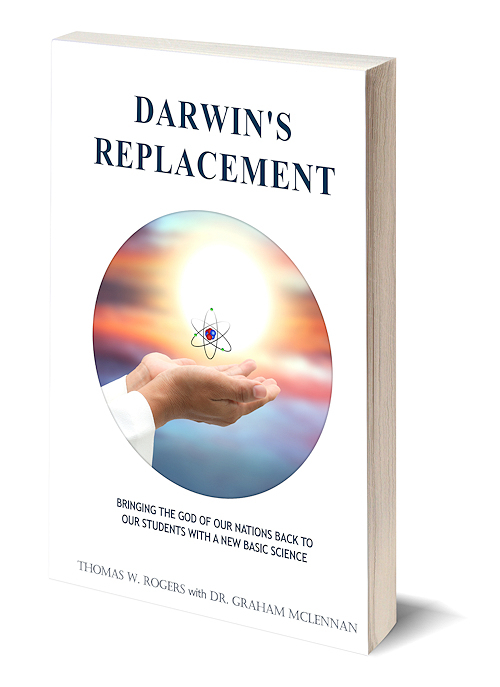 With all the scientific disagreement re: Darwin’s Theory of Evolution as the cause of life, WHY are we not teaching at least one possible alternative to our students at all pertinent levels? Is it because we dissenters are too diverse in our viewpoints, or not strongly united in this cause? Probably what is needed is for all dissenters to pick and promote one science that combines the best points from all of these in a logical, practical, verifiable, and understandable way. Over the last three decades, a new science (at least new to humans), has been explored and developed that is less outside-the-box than it is a thorough analysis of exactly what has to happen to produce living cell-parts, cells, and entities. The following glossary is copied from this primer produced by Reality Research & Development Inc., that outlines the proposal of Atomic Biology as a replacement for Darwin’s Theory of Evolution as the taught cause of life. Although some of the terms may seem technical, you will find that it is not “Rocket Science”. We believe you will find it much more personal and applicable to each of our lives. The basics are simple enough for a fifth-grader to understand. Many of these terms are interrelated. Atomic Biology: is the name we are giving to the study of the enormous amount of super-intelligent physical work that is essential for finding, sorting, selecting, counting, grasping, and precisely placing and fastening all the right numbers of the right atoms required for constructing, sustaining, growing, maintaining, and repairing all living cells and entities. This is a Godly science. It has recently been proven that mankind, even with all our accumulated scientific knowledge and sophisticated equipment, we do not have anywhere near enough intelligence to assemble any of the molecular machines needed for our cells. Therefore, super-intelligence (far greater than that of mankind), is essential to cause life. The proof has come, perhaps unintentionally, through 33 years of effort by the three 2016 Nobel Prize Winners in Chemistry, as well as R&D work by other chemists, including the James Tour Group at Rice University. All they have been able to construct over these recent decades are a few tiny molecular machines that are almost infinitely more simplistic than any of the molecular machines built for our new cells every day of the week. This rules out Darwinisms as the cause of life as, by definition, they have no intelligence to use. It is becoming more and more apparent that most sciences are studies of God’s super-intelligent, enormous, and careful works for us. vast majority of atoms are comprised of a nucleus made up of protons and neutrons with electrons being moved perpetually in orbits around the nucleus at controlled speed so as not to fly out of orbit by being moved too quickly, nor to implode into the nucleus by being moved too slowly. Atoms have no internal means of self-directed movement, no legs, fins, wings, muscles, or brains, and therefore must rely upon a super-intelligent external force to move them into their precise position in a cell. 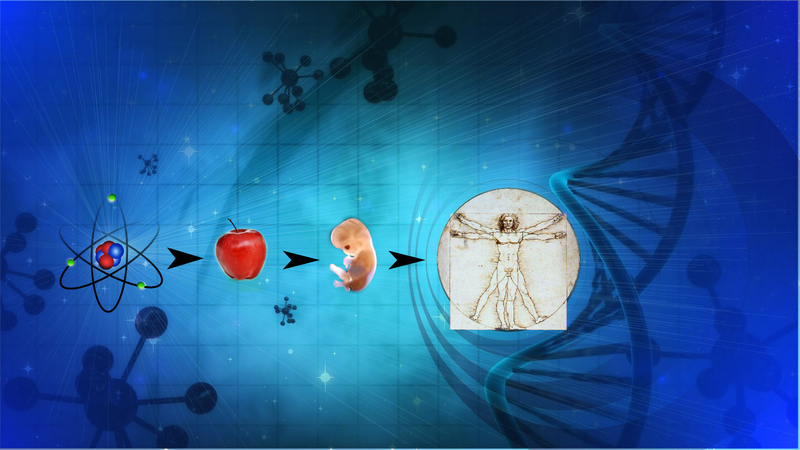 Biological Construction: the super-intelligent physical work of building living entities by finding, sorting, selecting, counting, grasping, and precisely assembling and fastening all the right numbers of the right atoms from available sources to build each and every living cell, adding the necessary ‘breath of life’ to each cell, precisely programming its DNA, RNA, etc. to make it specifically functional, and assembling various specialized cells into the particular living entity desired by the builder. Breath-of-Life: the supernatural basic necessity for life in every living cell without which no cell lives or functions. Common Descent: is an evolutionary concept stating that similarities between different kinds of plants and creatures indicate a common ancestor. However, a better understanding of the intelligent construction, sustenance, and maintenance work required for living entities reveals the necessity for a common designer, builder, and maintainer. Creation: the super-intelligent work necessary for the design, construction, sustenance, growth, maintenance, and repair of living entities by a super-intelligent force using non-living materials, i.e. atoms. Design: the super-intelligent process of planning the appearance and functions of a living entity, planning its source of the right atoms for its building materials, planning the right numbers of the right atoms to be selected from amongst millions of the unsuitable atoms, and placing them into their precise position for construction, sustenance, growth, maintenance and repair for each cell’s lifespan. Energy: the super-intelligent force supplied consistently, carefully, and constantly to provide controlled perpetual motion to virtually every electron in every atom. Evolution: Because this topic is so controversial, it is important to any discussion of it that the individuals agree on which definition of ‘Evolution’ they wish to discuss. Almost everyone in science can agree that there is the kind of minor or ‘micro’ evolution which means minor changes from generation to generation in hair color, eye color, body size, even skin color with children of mixed-race marriages. However, humans only have human children; monkeys only have monkey children, etc. One kind of creature does not give birth to another kind of creature even after long periods of time. For this book the ‘evolution’ we are referring to is the kind being taught in our public schools, colleges, and universities. This is ‘Darwinism’, ‘neo-Darwinism’, or ‘macro-evolution,’ which are theoretical explanations for the origin and cause of life and species whereby all species originated and descended from a single organism which was formed by a chance assembly of atoms billions of years ago. There is no guidance, purpose, or intelligent work involved with these theoretical processes. This original chance organism would have needed the highly complex ability to live, to function, to find nourishment and digest that to sustain its life, to reproduce, to remember its good qualities and pass them on with improvements, and to change into all the other kinds of plants and animals including, eventually, monkeys ascending into mankind, and to do all of this with no intelligent help through a totally unguided process. God: the name given by English speaking people and governments to the super-intelligent force and entity who creates and sustains all other living entities. He is like eternity and infinity in that there is no known beginning or end for Him. His controlled energy consistently moves every electron in every atom in every element perpetually at the right speed. He is the brilliant designer, builder, sustainer, maintainer and repairer of every living cell in every living entity including those in the food items necessary for our life. He is the provider of the ‘breath of life’ required by each cell of every living entity in order for it to live and function. He is the programmer of the DNA and RNA, etc. for every cell. His phenomenal works, capabilities, and care seem unlimited except by His own will. He is described as Omnipresent (present everywhere, e.g. we believe He has a form of presence in every atom to supply the necessary energy and control for perpetual motion of the electrons); Omniscient (knowing everything, e.g. by having a form of presence in all atoms, including those in our brain, then He can even know our thoughts plus everything else where atoms are); and Omnipotent (all powerful, e.g. the world has seen His phenomenal harnessed energy in the atoms of even a small atomic bomb, as well as being the Creator of all living things, and so much more). Intelligence: The ability to calculate the requirements for solutions to objectives and to provide the means to fulfill these requirements. Intelligence has to be supernaturally high when it applies to the calculations, provisions, and works necessary to arrange for all life functions in every living entity. Maintenance: the super-intelligence involved in maintaining, and supporting of cells for life extension in every living entity. This includes the delivery to each cell, the right form and amount of energy required for its warmth and function, delivery of the right type and amount of nourishment for its life, removing its waste products and disposing of that through the entity’s waste disposal system. Natural: an adjective to describe a temporary entity having limited lifespan and capability. Natural Selection: is a term used in Darwinism/macro-evolution to describe the survival of the fittest organisms. It states, understandably, that those living entities with characteristics that weaken their capacity to survive (such as the inability to escape predators or obtain nutrients) will have less chance of reproducing and passing on their characteristics to succeeding generations. Natural selection is also the theoretical “mechanism” for producing and maintaining life, however, it is not an intelligent force and does have the required capabilities to do all of the necessary super-intelligent work with atoms for constructing cells, including vision to find and count all the right numbers of the right atoms in available sources, nor means of grasping atoms, nor speed and dexterity for precisely placing the right numbers of all the right atoms to build any cell, nor the intelligence to program DNA and RNA, nor the power to provide the necessary ‘breath of life’ without which no cell lives or functions. In short, natural selection/evolution does not have the necessary capabilities to construct, sustain, grow, maintain, and repair even one cell. There are all these many super-intelligent works necessary to create living entities which natural selection/evolution cannot perform. Many evolutionists and former evolutionists now acknowledge this fact. Parameters of Possibility (for natural selection): is a maximum or limit to the capacity for accomplishment of objectives without intelligent or supernatural help. For example, if you have a large bowl full of marbles of ten different colors, how many groups of ten different colors do you think you could sort, select and pick out of the bowl in one second and place them in a circular pattern? Maybe 2? Not a very large number. This is while using your brain, eyesight, arms and hands; there are parameters or limits to the number you can handle. Now, let us suppose that you have no brain, no intelligence, no vision, no appendage for grasping atoms, as with the ‘natural selection’ theorized by Darwin and ‘macro-evolution’. Then how many could you sort, select and place in a circular pattern in one second? None? The point is that even with the best brain and intelligence of any species on Earth, there is a limit or parameter to the number of items we can sort, select, grasp and place in a pattern in one second. Now compare this to the work necessary just for the replacement of all our red blood cells about every 120 days. For just one average-sized human adult, over forty-nine hundred quadrillion (4,900,000,000,000,000,000) right atoms per second have to be sorted from his or her eaten food, then selected, counted, grasped, assembled into new red blood cells, and delivered into his or her blood stream (see Chapter 1 References). The number is huge for children as well. This is just a portion of the enormous amount of careful work performed constantly and reliably for virtually every person every second of every day. This requires supernatural speed, precision, intelligence, dexterity, reliability, endurance, and care. These are capabilities which ‘evolution’ does not have. Perpetual Motion: is consistently ongoing movement using the constantly controlled energy supplied by the supernatural force we call ‘God’. To our understanding it applies to the movement of electrons virtually forever in virtually all atoms. It is a ‘super-intelligent’ phenomena involving supernatural energy, control, intelligence, precision, consistence, work, and care. Perpetual motion is not possible without supernatural help. Selection: the deliberate and super- intelligent choosing of the right numbers of the right atoms as part of the works needed to build, sustain, grow, maintain, and repair living entities. Supernatural: an adjective to describe the perpetual force having abilities which immensely surpass human intelligence, speed, dexterity, capability, and endurance. See the definition of “God”. (A case can be made for the existence of an opposing force known as “Satan” who tempts people into much trouble, but we are dealing very little with that supernatural force in this book). Supernatural Reliability: the consistently predictable, super-intelligent works provided by the designer, builder, and maintainer of all living entities. A few examples we can rely upon Him for are: gravity to keep material items like us from flying off the face of the Earth as it spins upon its axis; sunlight for warmth, energy and its part in the growth and maintenance of living entities; the repositioning and healing effect of pharmaceutical atoms ingested to help healing and to relieve pain; the building of Red Delicious apples when Red Delicious apple seeds are planted, tomatoes when tomato seeds are planted, carrots when carrot seeds are planted, etc. All of these and much more are critical to life, yet because of our Creator’s amazing reliability and consistency, all the brilliant supernatural works and care involved are too easily taken for granted. Sustenance: the foods and beverages created by God for the nourishment of each and every one of His plants and creatures. From the available sources of the right numbers of the right atoms, He sorts, selects, grasps, and precisely assembles these foods and beverages for use by His creatures especially in developing energy for warmth and mobility of all muscles, for growth, for maintaining and repairing cells, for the phenomenal abilities to think, live, function, etc. Works: the supernatural efforts which are essential in the processes of designing, building, growing, sustaining, maintaining, and repairing of each living entity as the builder chooses. To provide correct information regarding the taught cause of life and move what we consider to be the falsified theory of evolution, to the history departments. The atomic analysis of unhealthy cells to determine the amounts of various elements lacking in these cells compared to healthy cells of that type, will help in developing pharmaceuticals containing the needed elemental atoms for the supernatural force we call “God” to install into the unhealthy cells.